What other Art Form keeps your Business Name, Logo, Location(s), Web Address AND Phone Number in front of your customers, 24x7... for up to TWO YEARS!? Posters like these can BRAND your business better than most other higher priced media. That's why advertisers love to renew their ads every edition... because customers see them so often. Folks put these colorful posters on their walls, doors, bulletin boards, windows... and leave them up for years! Then they can find take-out numbers, web sites, locations and more... 24x7. Reserve Your Map Ad for 2013-14 Now! If you're interested in being on the 2013 Athens Cartoon Maps, click here to contact us about reserving your ad position. BARK Marketing makes Athens Cartoon Maps... displayed all over town since 1992. They're great for visitors to find their way around (from logo to logo) and see all the great things to do. 15,000 posters are given away at sponsor locations, and customers are excited to get them FREE! 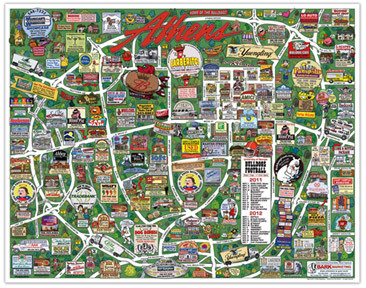 Check this data - click here for a list of locations used for the 2008 Athens Cartoon Maps. This is an example of the tremendous job we do with distribution. Keep in mind that most map producers only do 10,000 maps - we give ut 50% MORE - FOR THE SAME PRICE or less. We also have records of every poster produced and where they went... just ask. • What are the Ad Rates for the next edition? • Where are the Athens Cartoon Maps distributed? • Who does the actual artwork on these maps? For more details, CONTACT US soon at 706-296-8590. Thanks!